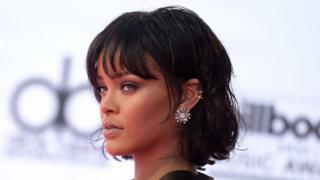 Singer Rihanna has cancelled a concert in Nice in the wake of the Bastille Day attack that left at least 84 dead. The pop star wrote on Instagram her gig on Friday at the city's Allianz Stadium "would not be going ahead as planned... due to the tragic events". The Nice Jazz Festival, due to start on Saturday, has also been cancelled. Many figures from the entertainment world have expressed shock at the news, with Simon Cowell among those sending "thoughts and prayers to all affected". Rihanna, currently in Europe with her Anti tour, was in Nice at the time of the attack but was said to be "safe" by her representative. The makers of the sequel to Fifty Shades of Grey - which had been filming on location in the south of France - also said everyone working on the film had been accounted for and was "safe and sound". Producer Dana Brunetti circulated the statement on Facebook, saying it was "another sad day for France and the world". Boy George tweeted his "heart breaks for France", while Cyndi Lauper said she was "so sad for the people of Nice". Comedian Amy Schumer, actress Mia Farrow and TV personality Kim Kardashian West are among others to express their sympathies. At least 84 people were killed when a lorry ploughed through a crowd during Bastille Day celebrations in Nice on Thursday evening. The driver drove 2km down the city's Promenade des Anglais at about 23:00 local time, before being shot dead by police. Youssou N'Dour, Melody Gardot and Britain's Laura Mvula were among those who had been scheduled to appear at Nice's Jazz Festival. The event was to have run from Saturday to Wednesday but has now been cancelled, as have some of the city's other Bastille celebrations this weekend. Festival organisers told the BBC all tickets would be refunded and thanked ticket holders "for their understanding". US singer George Clinton, who had been due to perform at the festival on Sunday, sent his "sincere condolences and prayers to the families of the victims". London-based rapper Tiggs Da Author, who was also scheduled to appear on Sunday, is another performer to have sent "thoughts and prayers" via Twitter. Thursday's events have cast doubt on whether Bastille Day, an action thriller starring Britain's Idris Elba, will continue to be shown in French cinemas. A spokesperson for distributor StudioCanal told the BBC it would let cinemas decide whether to show the film and would support them if they chose to withdraw it. The UK release of the film - which features a bomb blast in central Paris - was put back two months to 22 April following the terror attacks that took place in the city in November last year.